POSCO CEO Jeong-Woo Choi embarked on a tour to the group’s overseas subsidiaries in Southeast Asian countries, marking his first visit to the outside units since his inauguration last year. The four-day visit kicked off in Indonesia at PT Krakatau POSCO, a joint venture with Indonesia’s PT Krakatau Steel and POSCO. The CEO’s subsequent itinerary includes manufacturing bodies in Vietnam and a Myanmar gas field by POSCO International. Before the on-site visit, Choi completed strategic scheming of the region to identify POSCO’s future growth engine there. During the visit, he focused on actualizing the company’s vision as well as enhancing the regional understanding of the steel industry. Choi also took the time to meet the local employees and recognized their contribution to the company. 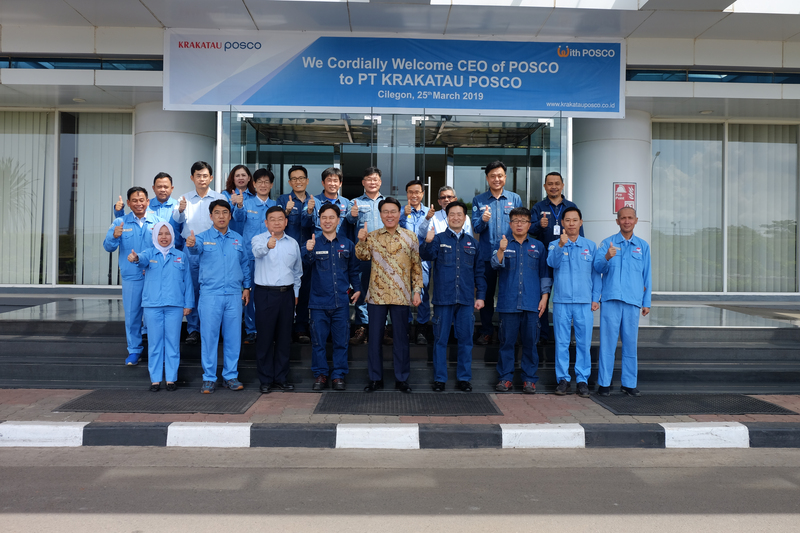 On the first day, Choi visited PT Krakatau POSCO, POSCO’s first overseas integrated steel mill and encouraged the local employees with a key message that the steel-mill field operation is at the core of the company’s success. He also emphasized the importance of meticulous facility management for a sound and reliable operation of the company. 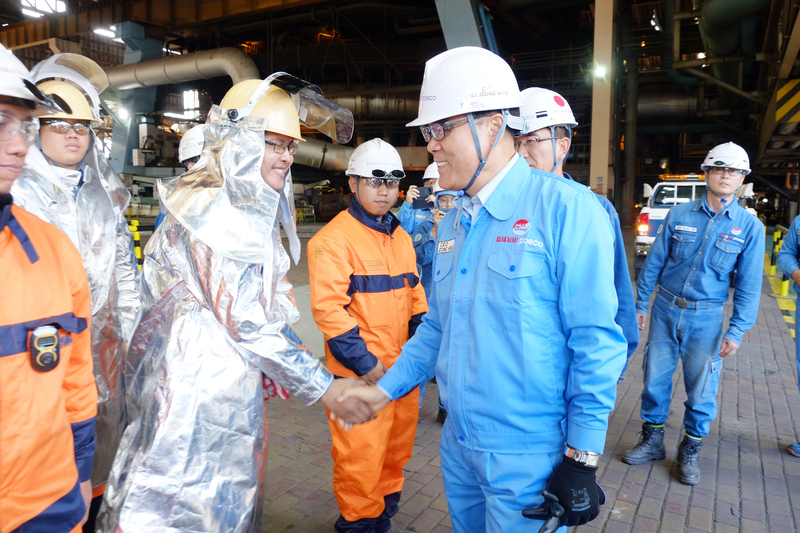 On the same day, Choi met with Silmy Karim, the CEO of Indonesia’s national steel company, Krakatau Steel, and discussed the two companies’ cooperation measures to boost the competitiveness of PT Krakatau POSCO and to expand profits in the country. PT Krakatau POSCO went into operation in 2013. It is the first integrated steel mill Korea initiated overseas with the country’s exclusive technology and investment. 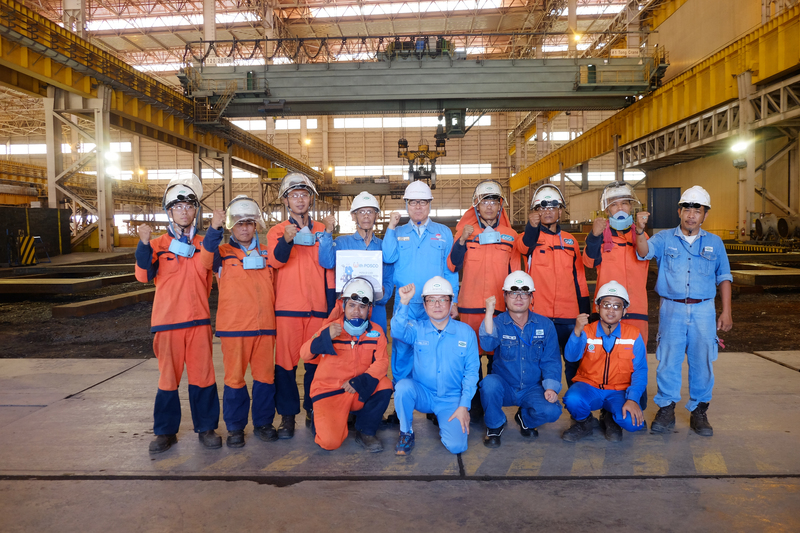 PT Krakatau POSCO is the first company in Southeast Asia that is capable of processing 3 million tons of slabs and thick steel plates per year. Last year, the mill logged 210 billion KRW ($184.6 million) in operating profit, an unprecedented achievement since its establishment. Since expanding into Indonesia, POSCO has been vigilant about supporting the displaced residents after the country’s frequent natural disasters. The company also extended support to the various community centers and housing projects to help solve challenges of the local communities. In 2014, POSCO established the PT.KPSE, a social enterprise to deal with the high youth unemployment rates in Indonesia. Through PT.KPSE, POSCO strives to become a conscientious corporate citizen by providing training and career opportunities for job seekers. PT.KPSE grew to become a self-sufficient social enterprise. It generates an annual sale of 1 billion KRW through clean-up and recycling operations at the steel mill, and it returns 70% of its operating profits to the local community. Following his Indonesian tour, Choi will visit POSCO Vietnam, a cold-rolled steel manufacturing subsidiary, and the group’s Vietnamese rebar body of SS Vina. After that, Choi will be at Myanmar to check the gas field developed by POSCO International. A significant portion of POSCO’s overseas investment has been concentrated in Southeast Asian countries, which include Indonesia, Vietnam, and Myanmar. The region is believed to have great potential and is expected to show substantial growth in the future. Meanwhile, before the visits to the overseas subsidiaries, Choi has been paying in-person visitations to several of the company’s critical clients across Korea—amongst whom include SeAH Steel, KISWIRE Ltd., LG Electronics—to discuss their mid-long cooperation plans. Copyrights(C) 2019 POSCO. All Rights Reserved.